Now that I've "heat mapped" 20005, I thought I'd next try my hand at 20009. As part of my continuous effort to understand what is selling where, I've begun analyzing 2007 residential sales per zip code per square to "heat map" the sales. 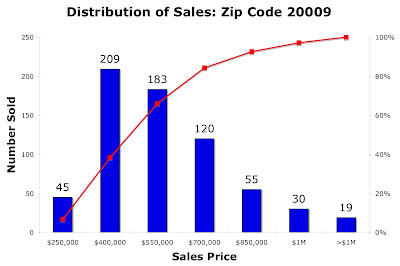 In other words, I've taken 2007 home and condo sales through August 2007 [the last full month of data I have in my database] and, for each zip code, calculated and mapped the average sales price for each square in the zip code. All properties in the District - for that matter,everywhere in the US - are identified by the square and lot on which they are located. Compared to 20009, 20005 was a cake walk: 20005 recorded sales in 19 squares while 20009 recorded them in 111. That 'volume' of squares is more than I can depict graphically using my antediluvian methods. Consequently, I used Google Maps' KML technology to create my heat map. I couldn't find a reference with the geocodings I needed for each square in the District so I had to improvise. The resulting map may be a little imprecise, but I believe it's close enough to give you an idea of what's going on. According to my database, the District recorded 703 sales in zip code 20009 through the end of August. I've excluded anything the District has not designated a home [rowhouse, detached, or semi-detached] or a condo, leaving 661 sales recorded [multifamily conversions are excluded because I cannot be certain they're truly single family homes]. It turns out that 575 of those sales were condos; of the rest, 81 were rowhouses, 1 was a detached home, and 4 were semi-detached homes. The chart below shows the distribution of sales in the area. Half [51.1%] of the units sold for $475,000 or less. Total dollar volume for 2007 sales in 20009 during the period was $338,376,489, roughly four times that of 20005. The legend at right explains the colors used for each pin on the map. For example, a yellow pin on a square means the average price for the square is between $700,001 and $850,000. You'll get the exact data when you click the pin. I'd appreciate feedback on whether using this type of map is helpful. I like the formats. Very informative. I'm trying to get my mind around the $450k to $475 median. Is that due to conforming loans? Will the median drop just because jumbo loans are getting tougher to qualify for? I do like this blog a lot. But I don't get your heat maps: shouldn't the colors follow a natural gradient, with cool colors indicating lower prices and warmer colors indicating higher prices? Orange and red are real close in color but indicate very different prices. And purple is a cool color, but it indicates a relatively high price. More careful color choices would help a LOT.